How shall I live this Word? 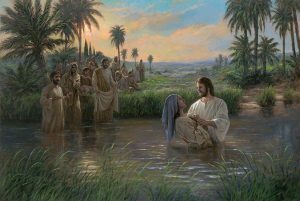 The baptism of John and that of Jesus live in a united dance that brings them together in sovereign harmony: “the lamb of God” who offers Himself to the world is the fulfillment of all the previous rites, the last offering before which everything else is a pale foreshadowing. As John recalls the whole secular tradition of Israel, so each of us would be deprived of our own genetic heritage if we were to deny our past and its traditions. We cannot evade the first level of our approach to faith: it is in our humanity – and not in spite of it – that the Lord loves us! We must be willing to meet Him within our own personal history, and the familiarity with God cannot be resolved into a disembodied spiritualism allied with angelic virtues. John, the last prophet and emblem of every prophet, knows how to step aside and recognize the point of arrival of every prophecy, experience, and makes us experience that the fulfillment of every conversion is the joy of being in the presence of the Bridegroom. The difference between him and Jesus is the same as that between waiting and meeting. Through John and his word “earthly things, instead of becoming idols, refer to the heavenly things” (St. Fausti). The parallel coexistence of the two economies – one short because the Baptist is about to be thrown into prison – is interpreted as unfair competition by those who cannot detach themselves from the ritualism of “purification”, but John dampens the bitterness of the intolerant disciples. In him the joy of the first love, or the exultation of the first encounter with Jesus still in the womb (Lk 1:41), remains alive and actual. A heart inhabited by God lives in perpetual joy because of the presence of the beloved. Rivalries and disagreements with others, perhaps for “religious” reasons, risk polluting this beauty. I immunize myself against these viruses by asking the Lord for a heart capable of loving everyone, to take on the other’s point of view, to understand how even for my enemy there is a plan of salvation, and that his life is visited by Him. They can make life a little unpleasant, they can deprive us of some material goods or some freedom of movement, but we ourselves are depriving ourselves of our best strengths with our wrong attitude: with our feeling persecuted, humiliated, and oppressed, with our hatred and our bragging that masks fear.